It's not about quitting cold turkey. With the series of Rien Pipe filters, you continue to smoke but continue to reduce the amount of nicotine and tar consumed. By the end of the Rien Pipe program, most graduates don't feel like smoking anymore - all without experiencing the stress of sudden withdrawal. Using Rien Pipe is incredibly easy. Simply slide your cigarette into the Rien Pipe filter and smoke as usual. It goes to work immediately to gradually remove nicotine from the smoke you inhale. In fact, Rien Pipe will cut the amount of nicotine by 3% each day, with a 95% cut in 31 days. The 3% decrease in nicotine is so subtle that when many smokers start quitting with Rien Pipe, they wonder if the product is actually working (spoiler: it is!). Some people also notice that they are smoking a little more than usual a few days into the program. This is considered normal, and the body's way of trying to adjust with decreased nicotine levels. While Rien Pipe is designed to help you quit smoking completely, results may vary from smoker to smoker. 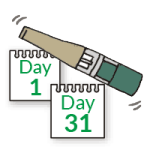 Using pipes 1 through 31 will ensure a 95% nicotine cut in 31 days, which alone can help make it easier for you to quit. When used as directed with a 0.1mg nicotine cigarette, Rien Pipe will help you reach the final goal of 0.005mg nicotine -- a state that is practically the same as not smoking. Many people begin tiring of smoking by around Days 20-25 and may spontaneously decide to give up. By Day 31, you are capable of quitting at any time, as your body is no longer physically addicted to nicotine. For various reasons, not everyone is ready to make the transition to a smoke-free lifestyle at this point however. If you find that at the end of your quit schedule, you aren't yet ready to quit, we recommend not stressing over the point and instead continue to clean and re-use Pipe #31. This will ensure that your body is maintaining low nicotine levels while you can better understand your smoking triggers and other factors surrounding the mental aspect of smoking.